Callum is 11 years old and is autistic. Three years ago, his behaviour was so extreme that his mother, Julie, felt she couldn’t go on. Although Callum had been diagnosed as having a mild form of autism, his behaviour was extreme. He would kick, bite, and lash out at Julie when at home and, though he attended a mainstream primary school, he had extremely poor concentration levels, and lagged far behind his classmates in reading and comprehension. Callum is Julie’s only child, so when his behaviour first began to seem extreme around two years of age – she had no previous experience of what to expect. One day, when Callum went for an eye test, she simply broke down and felt she couldn’t go on with it any longer. The optician recommended that Julie should seek help – a recommendation she followed which eventually resulted in Callum being diagnosed as autistic. Although Julie received some help for Callum at school, her home life remained a nightmare. Callum wouldn’t sleep and Julie had to physically restrain him to try and get him to relax. This sometimes went on until one o’clock in the morning before Callum would eventually fall asleep out of sheer exhaustion. But when Callum was 8, Julie received a letter which was to change her life – and that of her son. The letter came from the Headmaster at Callum’s primary school, explaining that another Head Teacher had organised an evening at the school to explain the work of a small charity he had had first-hand experience of. When BIRD’s Clinicians met with Callum and Julie for an initial assessment, they confirmed what she already knew; there was nothing mild about his condition. In fact, Callum measured 86% on the scale used by the charity to measure what they call “organic brain dysfunction” where the lower the score is – the better. BIRD’s clinicians explained the treatment methods and how they work to Julie. When she decided to take up the BIRD programme – along with 25 other families in her local area – the charity’s clinicians taught her how to do a specifically-designed exercise regimen with Callum. This is completely non-strenuous and takes around 30 minutes each day. BIRD’s unique method of treatment takes the brain back to its basic development and retrains the primitive reflexes present in all people at birth. But little by little, Julie began to see changes. Callum became less resistant to the half hour and even began to enjoy it. She also began to see changes in his behaviour. He became calmer and she was able to do little things she’d never been able to contemplate before – like taking Callum to the supermarket. After 18 months on the programme, as BIRD’s clinicians made small changes at regular intervals to the regimen, Callum had changed beyond all recognition. Prior to the BIRD programme, Callum’s school felt it was in appropriate for him to be entered for the SATS tests. 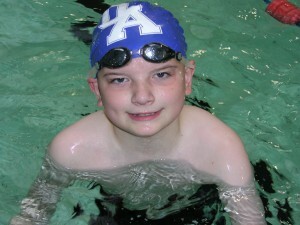 Now, not only has he done his SATS, he is also captain of the school swimming team.